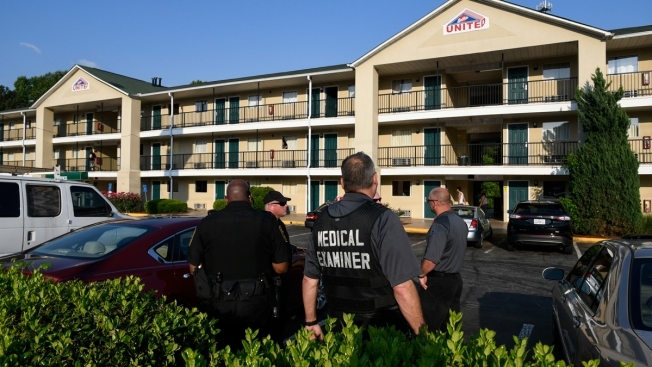 DeKalb County medical examiner and law enforcement stand outside the United Inn and Suites Saturday, May 12, 2018, in Decatur, Ga. Officers were called out to investigate a dead body found inside a room that had a strong chemical smell which began to make the officers sick resulting in three being sent to the hospital to be checked out. Police outside Atlanta said three officers will recover after being sickened by chemicals Saturday in a motel room where a body was found. Dekalb County Police spokeswoman Shiera Campbell says the three hospitalized officers are conscious and alert. She also told the Atlanta Journal Constitution that the guest's death at the extended-stay motel is not being treated as a homicide. Police think the chemical killed the man, but they don't know yet what chemical it is, or whether the man was exposed accidentally or on purpose. Fire Capt. Eric Jackson said samples of a substance were recovered by a hazardous materials crew. An autopsy will be performed by the medical examiner. "Something in there made the officers sick," Jackson said. "We have no idea what, none whatsoever."